I’m the kind of person that has a lot of pet peeves because I get annoyed easily. However, I always find choosing the top five rather difficult. Yet I will try on this snowy, disgusting day. Tardiness. I hate when people are consistently late. It’s rude and it drives me crazy. If I can show up on time, so can you. I understand that there are some circumstances where it’s fine and excuses are acceptable but if you just forget to leave or intentionally leave late, that’s just rude and I don’t understand it. It wastes my time and I hate when people waste my time. Lying. I don’t understand why people lie just for the sake of lying. If I catch someone lying I lose all respect for them and I can no longer trust them. It can really ruin a friendship or any type of relationship if someone lies. By lying you’re discrediting yourself and any type of information you have shared with a person. It’s a terrible thing to consciously do. Fake people. This is up with lying. I don’t get how you can just pretend to like someone you really don’t like at all. It’s common to talk about a friend when they’re frustrating you but it’s another to talk about how much you hate someone and still pretend to be their friend. It’s stupid. I don’t understand why people think it’s an okay thing to do just to spare someone’s feelings. How do you think they would feel if they found out? Static. I hate when things get staticy. It makes so anxious when my clothes or sheets get staticy. It drives me crazy and I don’t know why. It’s one of the grossest feelings ever to me and it makes me want to get rid of anything that can contract static. Static guard is my best friend. People who pretend to be dumb. I don’t know why girls usually pretend to be dumb. I don’t know if they think it’s cute or something but it drives me crazy. If you’re smart why hide it? Be yourself and embrace who you are, don’t try and hide the things that make you the person you are. I will never understand people who do this. I wish I was smarter than I am and I’m jealous of people who are really smart so don’t try and hide it! I know I have a lot of pet peeves and they’re kind of weird. 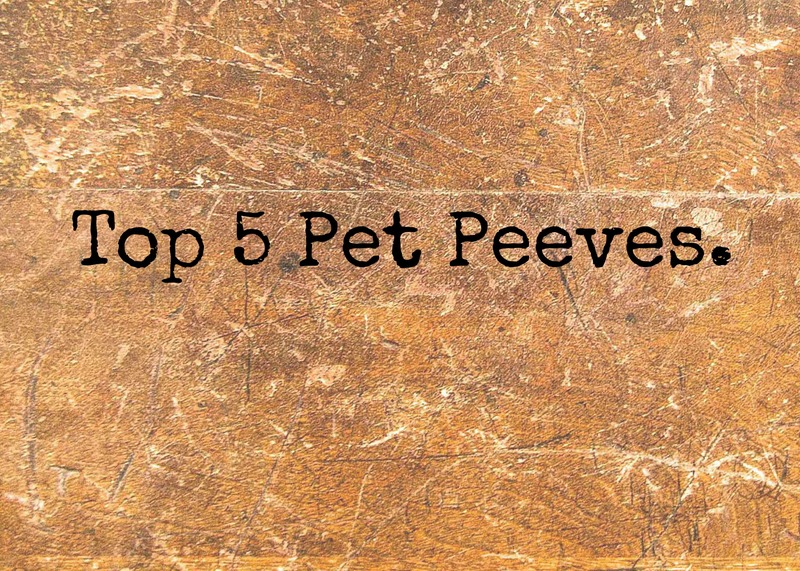 What are your top five pet peeves? Some of your pet peeves are mine as well. I hate the concept of lying, whether it be lying to be cruel or lying to spare one’s feelings. I also hate fake people and when people continue to talk to people just to talk to them or so that they are liked. If you don’t like someone, you don’t have to be mean, but you also don’t have to act like you like them; it’s deceptive to both yourself and that person. I also can’t stand when people water down soap so that it lasts longer (I know this is a stupid one, but I can’t stand it!). I also can’t stand when people cheat (whether it be on school work or on their boyfriend/girlfriend or spouse. I also hate prejudice and racism. Along, with cheating, I hate plagiarism (maybe because I enjoy writing so much?). I hate plagiarism so much that when I hate to cite stuff in school I was extra careful that I did it right. I don’t know if this counts, but another pet peeve is anxiety and how much it can control someone. Oh the soap thing is so gross!!! It makes me feel so gross. Totally understand the anxiety thing too. Yeah and I hate when it looks like real soap and then you find out someone watered it down! Right! Like it’s just cold and disgusting.